Clearly I didn't get very creative with Tuesday's work outfit; it's basically the same look from the last post. To make it more work-appropriate, I swapped out the see-through lace tank for a more conservative blouse and the jeans for trousers. Don't worry... the glasses won't be making very frequent appearances! And here's the shirt again! I wore this ensemble for a night out in Madison. 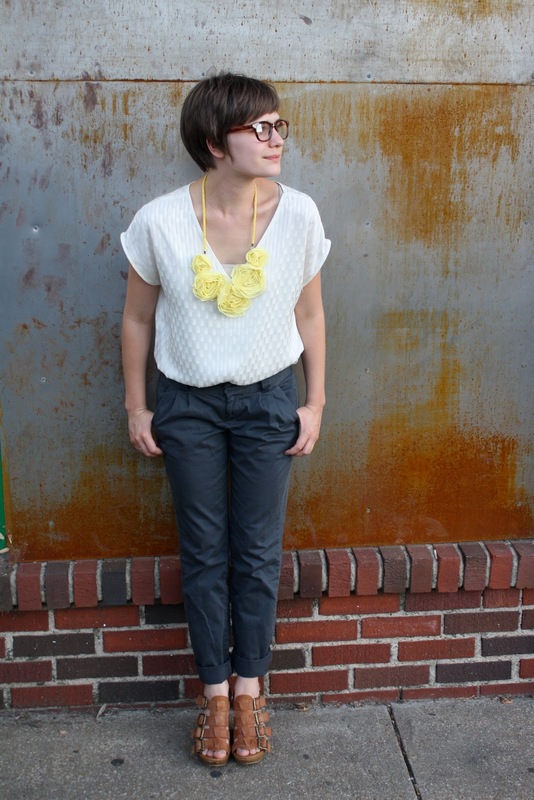 I love the pops of the colors in these outfits, the yellow necklace, and the red flats! I've been silently stalking your bog for some time...LOVE. Those glasses look so cute with your hair cut. you look extra pretty in that last picture! I love the outfit as well. the first outfit is great. my favorite outfit all week. CHECK OUT MY $100 GIVEAWAY TODAY!!! OH MY GOD how did you get such a cute freaking UO shirt for only $10??? was it horribly mangled? I don't even.... what. JEALOUS. You look great in your glasses. As a sometimes glasses wearer I love to see spectacles appear in fashion blogs! i didn't even notice the similarity because tucking the shirt in with the different pants makes it look quite different. did you say madison? my boyfriend and i are going there later this month and i can't wait--i've never been. how did you like it? those high-waisted jeans look really really good on you. But the glasses are so cute! Your necklace is so cute, I love the yellow. i hope you had fun in madison! i lived there for four years when i was going to college at UW. i was even there last weekend visiting some friends! i miss it there for sure! I LOVE this outfit! The tank is great and those jeans are AMAZING! Also, I'm diggin' the glasses. Glasses are a great style piece . . . I've always had horrible vision and used to hate glasses as a kid (ya know, the fear of "four eyes" comments) but now I use it as an excuse to purchase nice frames. Good choice. every time you post those trousers i am inclined to go STRAIGHT to old navy .. alas they will not be there! maybe one day me and the pants will have a chance meeting at a thrift store!